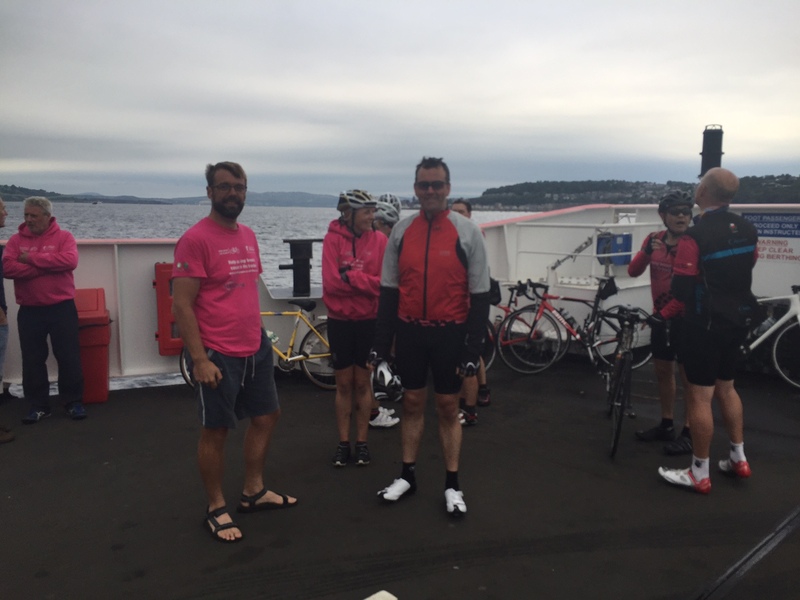 First, the 99 miles posted for today included six miles on a ferry from Gourock to Hunter’s Quay. That meant we were only cycling 93 miles! Second, despite Stefano’s challenges on the ingredients of the Goat’s Cheese Tart he had for dinner last night, the chef showed up to cook us breakfast. 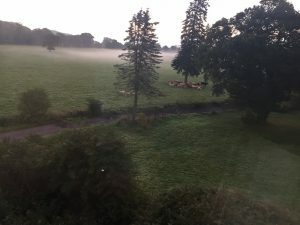 Our accommodation was very rural, and I had not really thought about that. I pulled back the curtains first thing, to check if two pairs of gel pants on the ledge had dried, and was rewarded with the most magnificent view of a mist laden field with the cattle still waking up. Lovely. There was a fair bit of debate about the route, largely because the one initially plotted involved close to 6,000 feet of climbing, mainly of the short sharp variety. Nick (who grew up in this area) came up with an alternative, that was exactly the same distance, involved one third less climbing, and for the final 25 miles tracked the coast. Steve, Sara, Doug, Kate and Andy went for the inland route; the rest of us opted for the coastal alternative. We were a bit uncoordinated in setting off. John, who has a serious calf problem went out first to get ahead. Our women got fed up waiting for the men and Karen, Kerry, Marion and Susan left, with Nick, Stefano and me out last. We took the A76, a busyish road which is up and down, but not in a spiky way. It runs through Thornhill, Sanquhar, Kirkconnel and Cumnock, to Kilmarnock. 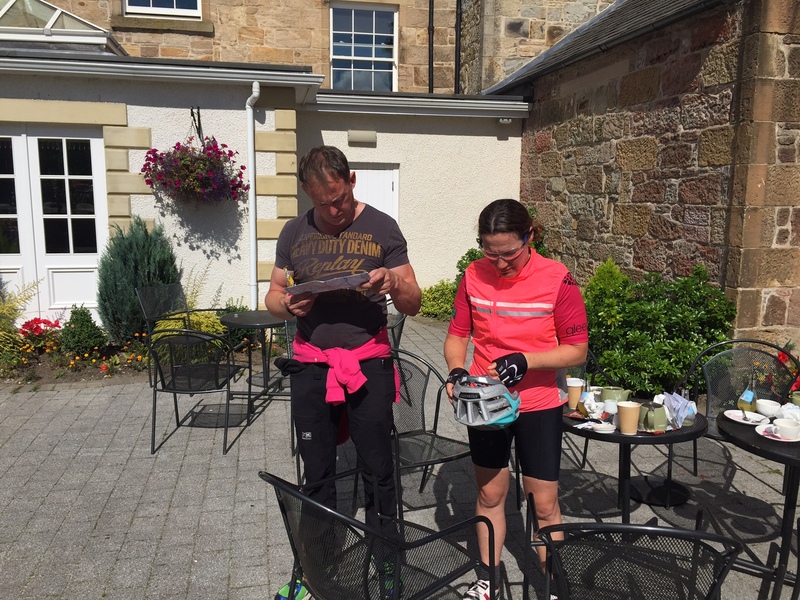 After 37 miles we stopped at the Dumfries Arms in Cumnock; another Life Cycle touch point as we stayed there on both LC2 and LC4. We were too early for the restaurant and ended up foraging on a mish mash of cake from the coffee shop, sausage rolls from Greggs, and stuff from the back of the van. Even by Life Cycle standards, an unbalanced first lunch. As the others headed north towards Stewarton and Beith, we headed north west towards the coast, in hilly terrain, through Craigie and Dundonald, eventually landing at Irvine. For some proper food, we stopped at the Morrisons Superstore at Stevenson. In the meantime, Stefano pressed on with John, who had secured an appointment with a physio in Dunoon to try and do something about his calf. He made it and now has a heavily strapped leg. 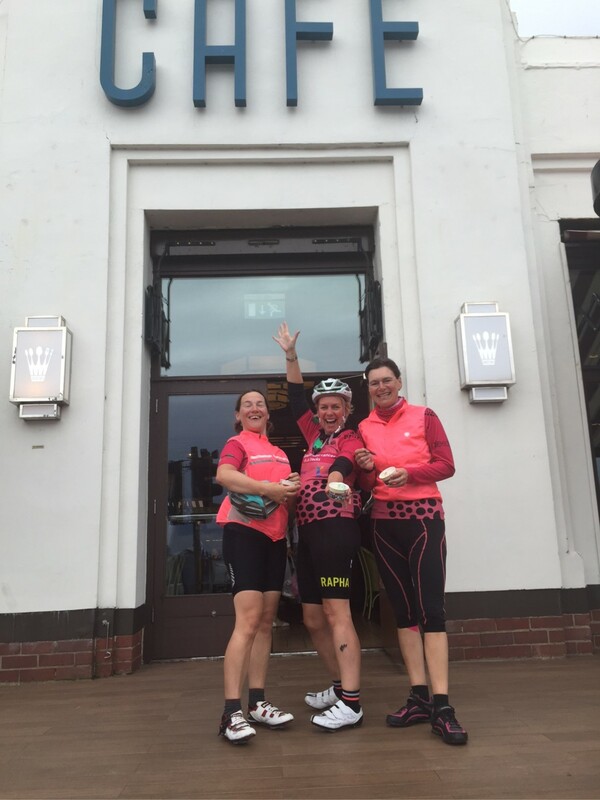 Beyond Irvine you continue on the A78 to Saltcoats, West Kilbride, Fairlie and on to Largs. 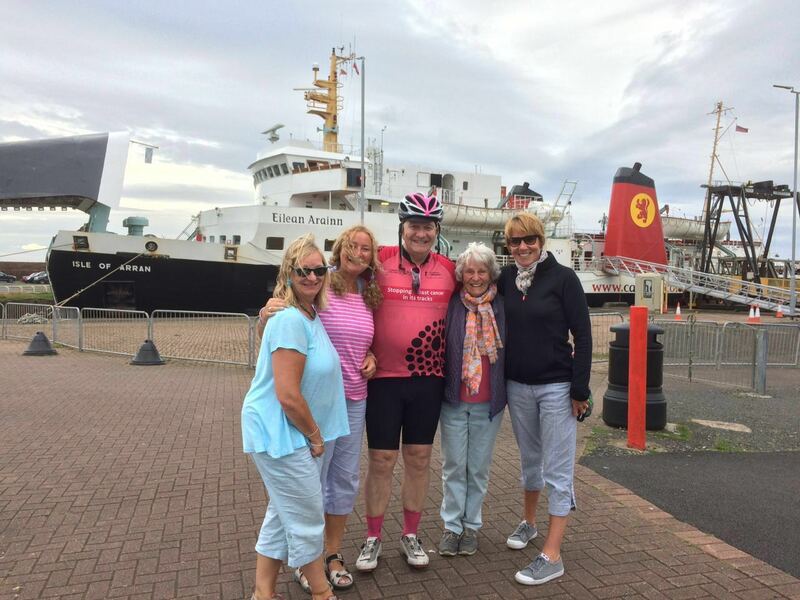 At Ardrossan Nick peeled off to meet Julie, his Mum and his Sister coming off the Arran Ferry. What a nice picture. From Ardrossan we headed for Largs. When I was a boy those from Shettleston headed for Saltcoats; those with a bit more money headed for Largs. So Largs was a new experience for me. Nice place. And we had a stop at Nardini’s, famous for its ice cream, and art deco interior. And then there were four. 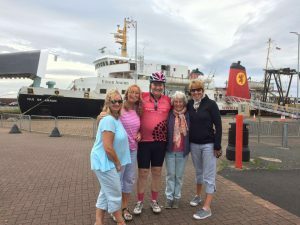 Marion peeled off to meet a friend who had sailed from Rhu to see her. Karen, Kerry, Kate and I ploughed on to Gourock: sixteen miles in 45 minutes, at the end of a day. We impressed ourselves. We arrived at the ferry at 1800. Amazingly, despite the fact the other five had taken a completely different route, they arrived at more or less the same time, and were on the same ferry! The coast run along the A 78 was superb, fine vistas, fresh sea odours, and a quick road. That was nicely topped off by the ferry crossing. Even in overcast conditions, we had 360 degree panoramic views down to Arran and the Mull of Kintyre, up to some of the inland lochs, of course to Bute itself, and of North Ayrshire. 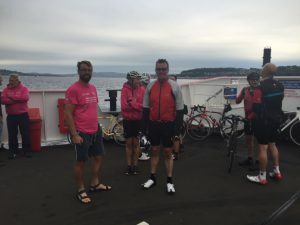 We were all in at Dunoon by 1830, not bad for a 90+ miles day plus a ferry crossing. This is another place I visited as a boy, and I do remember it, though it is much closer to Glasgow than it seemed then. Marion, Nick and John also know these parts from their childhood. We rode on some nice surfaces today. We also rode on corrugated concrete (and interestingly you only ever see signs on who is responsible for road maintenance at recently resurfaced stretches). Some of these surfaces absolutely batter you, and your bike. Today Doug’s frame actually fractured, a clean break. That is his favourite bike’s Life Cycle over, and he will have to ride out the remainder on one of the spares. Our Support Team were again terrific, tracking two routes, undertaking running repairs and cleaning out the local Greggs in Cumnock. They even extended to reminding Kate it was her wedding anniversary. Gavin completed his stint with us and will fly back to Glasgow tomorrow. His role for the final five days is taken up by Simon Hopkins. Simon supported us on the first three Life Cycles so has a lot of experience. 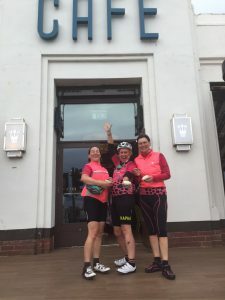 Our Life Cycle miles today were for Claire (nominated by Susan) who has sadly passed away; Elizabeth O’Riordan (nominated by Emma Oldham) whose blog is an inspiration to others; Doug Harper (nominated by Cheri Ambrose) another face of male breast cancer. They were also for my friend and colleague Sarah O’Hara who allowed me to nominate her; what a fabulous role model she is. Just one reportable quote today. As bags were being unloaded, Paul asked for my backpack. Gary passed him a bag. Paul said, ‘that’s not David’s’. ‘I know’ replied Gary, ‘it has a hairbrush in the side pocket’. Thanks Gary. Finally, a brief Magomnium update. First competition resumed today. The first event was the Cumnock Sprint, won by Kerry, Karen, Marion and Susan. So, 10 points each for them. Second, Stefano was awarded 10 bonus points for doing such a good job in getting John to the ferry in time for his physio appointment. Third, after much debate, Kerry was allocated the average of points awarded to others and is now in the game. And there is a new discipline now that Simon has arrived, Kerby comes in to play. Watch out for the Support Team. I know I said I would provide a full leader board today, but I have run out of space. Another 93 miles completed, taking our total to 966. Tomorrow we head for Oban via some big climbs. I’m glad the breakfast was OK even with Stefano’s comments about the goat’s cheese tart, but to be fair the tarts he makes are devine! It’s great to see Simon with you again. But if my husband brings back another kerb won in an auction then he can keep them both in the divorce settlement. Thinking of you all and wishing you strong legs today! Champions. Another day, more impressive progress. Congratulations to the team! Glad that the Dunoon ferry gave you all some time off for good behaviour; sorry to hear that after such a tranquil start to the day, Doug’s favourite bike has been defeated by the challenge, equally pleased that John’s calf has had professional attention (was this an intentionally bovine-themed post I wonder). Look forward to seeing Kerry’s appearance on the leaderboard – hopefully with expectations managed as this is clearly a different scale to UCAS points. You are all doing so brilliantly – I will be googling synonyms for excellence and fortitude in an attempt to offer some varied comments as you pass the 1000 mile mark and complete the final days of your epic challenge. Really enjoying reading the updates – particularly as you are now in my country of birth! Nardini’s… now that brings back fond childhood memories – didn’t realise we ‘wus well aff’ as we headed to Largs instead of Saltcoats and we didn’t live too far from Shettleston either! What a challenge you are all bravely and gallantly undertaking, can’t imagine how your muscles must ache of an evening? Kerry is that a new bruise on your leg? Keep up the good work and keep the posts coming, I am enjoying the vicarious exercise as a substitute for getting on my own bike!